EyeTV puts detailed and up-to-date TV listings at your fingertips. EyeTV’s integrated Program Guide harvests the TV listings data contained in over-the-air digital broadcasts as well as online sources. It’s a breeze to search the Program Guide for shows you want to watch using multiple criteria and full text search terms. That means you can search for shows featuring your favourite actors, directors, topics, and even genre, and save each search as a Smart Guide. Interested in a particular TV series? In one easy step you can create a special kind of Smart Guide, called a “Smart Series Guide”, to search out all the upcoming episodes. It’s easy to filter out the repeats to find the brand new episodes that you haven’t seen yet. Smart Guides and Smart Series Guides continually update to add shows to your saved searches as soon as they appear in the Program Guide. Note: Smart Guide features require a Gracenote or IceTV subscription. If you travel frequently, you can save your channel list configuration for each location and easily switch between them with a click. No more re-auto tuning, renaming, or sorting channels after you’ve used your tuner in a different place. It takes just one click of a button to record your saved searches, or Smart Guides. Simply check the appropriate box in your Smart Guide. When you click the Record All button, EyeTV creates a Smart Series Guide which will automatically record the entire season of that TV series. And EyeTV is smart; if you’ve already scheduled another recording at the same time an new episode is broadcast, EyeTV will automatically record it the next time that same episode comes on as a repeat. EyeTV will also set up a Smart Playlist for that TV series, and to save space on your hard disc you can tell your Smart Series Guide how many episodes to retain. And to make things easy, you can tell EyeTV to do your filing for you. Simply create Smart Playlists to update in real time based on the criteria you choose. Or, set your recording schedule to go to a specific playlist automatically as soon as it finishes recording. A Smart Playlist is created automatically whenever you set up a Smart Series Guide to record the entire season of a TV series. Browse the EyeTV Library in List view or Cover Flow, or use Spotlight to search your recordings by name and description. If you have prepared recordings for iPhone access, then EyeTV even supports the Finder’s QuickLook feature. Use EyeTV’s built-in Editor to remove unwanted content from your recording, or to crop the beginning and end of the show. The Editor also enables you to create one or more short clips from a longer recording and save the clips individually as new EyeTV recordings. If you’re in a hurry, simply export video clips straight to your iPhone or iPad without saving them first. EyeTV enables you to export your recordings for post-processing in other Mac applications and professional video editing software, such as iMovie® HD, iDVD®, or DVD Studio Pro®. It offers a large variety of intelligent presets which selects the optimum export format for you, or you can chose the settings yourself. EyeTV also includes support for Sony PSP and other current media types & playback devices. Enjoy last night’s late show on your iPhone or iPad during your morning commute. Watch some movies on your iPad during that long plane ride. Enjoy your own recordings on your widescreen television with an Apple TV. EyeTV can send your recordings to iTunes automatically for optimized playback on the Apple device of your choice. EyeTV records and plays Dolby® Digital sound, including 5.1 multichannel audio, where available. EyeTV also supports the digital optical audio output built into newer Macs and passes through Dolby® Digital 5.1 sound to home theater systems. EyeTV is the only TV software that supports “Progressive Scan” for excellent picture quality, and it is capable of displaying full resolution HDTV on Macs with Intel Core Duo processors or dual G5 processors. EyeTV also supports closed captions as well as Picture-in-Picture (PiP). With the EyeTV app for the iPhone, you can watch live TV and EyeTV recordings wherever you have a WIFI or 3G connection, whether you’re around the corner at the coffee shop or travelling around the world. 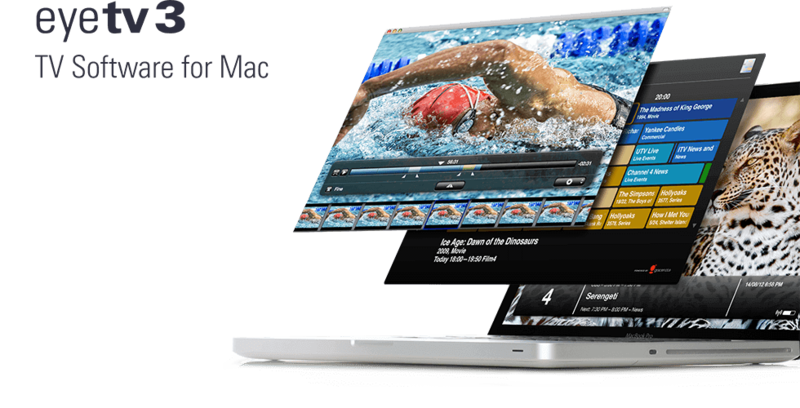 The EyeTV software running on your Mac converts live TV to the correct format for streaming to the iPhone, ensuring optimal picture quality. Both EyeTV software and the EyeTV app use the HTTP streaming standard developed by Apple. This takes advantage of the iPhone’s hardware acceleration to deliver the highest possible playback quality and longer battery life. * Feature requires a Mac and is not available on a PC. EyeTV app availability in the App Store is subject to Apple approval and cannot be guaranteed. If you’ve got more than one Mac in the house and EyeTV 3 is installed on all of them, then you can share EyeTV recordings over your local network. Shared libraries show up in the sidebar, and you can browse and play them in standard or HD resolution. "...the TV tuner is only as good as the software that controls it...Elgato's EyeTV 3 software is just about perfect." "What’s great about EyeTV is the incredible scope and generally smart, intuitive functionality of the software: what you get here is now officially leagues beyond what TiVo and its many lesser competitors offer in today’s digital video recorders." "EyeTV 3's standout feature is surely smart guides. If you watch a lot of TV or often hear about programmes retrospectively, you'll wonder how you lived without it." "Elgato Systems' EyeTV is one of those products I simply can’t live without. (Well, okay, I could, but I wouldn’t like it). Version trois continues the product’s run of robust updates."